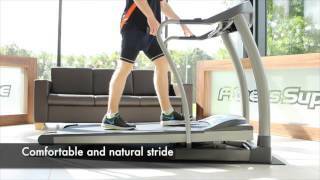 Fitness Savvy has taken a look around to find out as much as possible about the Horizon T4000 Treadmill. Firstly, you can select which version of this treadmill on this very product page – either the T4000 Premier or the T4000 Elite. Once you’ve selected which version, the relevant price comparison table will appear. This product is defaulted to show the Premier pricing, however, if it is out of stock, no price will show! Be sure to read this guide and see why the Elite version might be a better choice. If you’re not sure what the differences are, then we’ve covered it here. Price: At the time of writing, the Elite is £1,499, vs £1,099 for the Premier version. 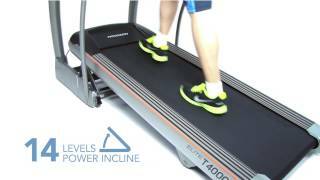 Incline: The Elite features a steeper incline of 14% vs 12%. Programmes: Elite has 12 compared with 10 for the Premier model. Speakers: Elite version comes with MP3 compatible speakers. The console for the Premier, however, does not. Passport-ready: The Elite allows you to view real-world footage wirelessly on your television. The Premier does not have this feature. proFILE Performance Tracking: Elite model records workout data and evaluates progress over time, unlike the Premier. As you can see, there are a few significant differences between models. While they share the same motor, top speed, frame type, cushioning and running belt, they differ greatly in features. We hope this helps you better decide which is the right model for you. 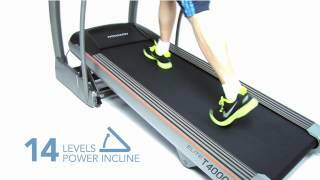 We took a look online and found a total of 22 online customer reviews of the T4000 Premier treadmill. Overall, it scored 87% (4.4 out of 5). We couldn’t find any detailed reviews of the Elite version, so all of the pros and cons below relate to the T4000 Premier model. We’ve also included some videos of both versions below which might help you with your running machine purchase. One user has had this treadmill for over five years and said it is as good now as it was when he first bought it. Two customers had faults with their treadmill and found it difficult to get an engineer out to look at it. It reportedly took numerous phone calls and one reviewer said to expect to manage the parts and engineer scheduling yourself. One user reported faulty treadmill on delivery. Another user commented that it could get stuck at 12% incline. Switching it off and resetting it appeared to resolve the issue. Displays speed only in mph. If you want it to display in km/h then you’re out of luck. In summary then, the T4000 treadmill represents great value and is certainly one of the best treadmills around for the price. In terms of comfort, reliability and build quality, three of the most important priorities when choosing a home treadmill you will struggle to find anything better. It may not be the most sophisticated console but there will be more than enough features and variation for most people. This model isn’t going to suit everyone because of that conscious decision to find that middle ground between the gym-level model and the apartment-friendly one. There are a few elements missing for the fitness fanatics, but the customisable programs should make up for that. This, and the other accessible features and comfort mean that the Horizon treadmill is still recommendable for many homes. If this model is not the right one for you, you can always compare prices on cardio machines such as exercise bikes, cross trainers and zero runners. 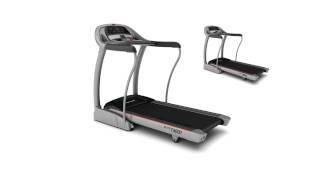 Built with a powerful 2.5 HP Digital Drive motor, the Horizon T4000 Treadmill powers speeds of up to 20km/h. With an incline of up to 12%, this treadmill remains quiet and smooth – even at the top levels! In addition, ergonomically placed one-touch speed & incline controls (built into the sidebars) make workout adjustments super easy. Fundamentally, the Elite version of this treadmill is the same as the Premier, other than the differences we already mentioned. Want the best price? Well, Fitness Savvy is the place to be. We are the UK’s first and only dedicated fitness price comparison website. Not only can you compare prices, but you’ll also find the latest deal and offer codes built into product pages – how awesome is that?! We look at prices from top retailers including Fitness Superstore, Argos, Amazon, eBay, Decathlon, Sports Direct and more. In addition, we include relevant discount codes and vouchers on our product pages to help you save even more. Check out the ones below to see if you can get an even better deal on the Horizon T4000 Treadmill.